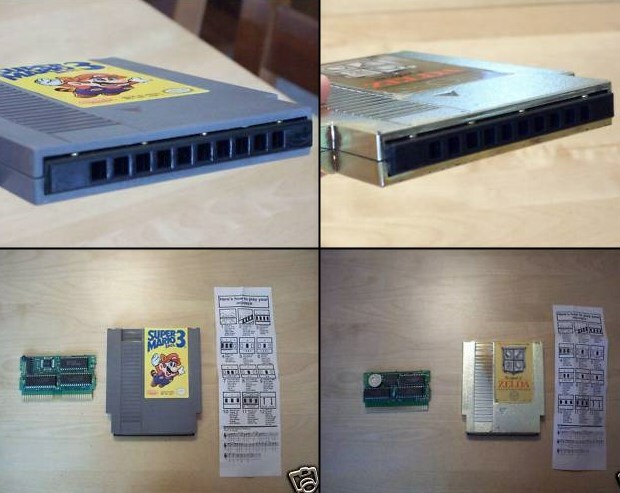 For those of us old enough to remember, or for those that may still play around with a NES today, blowing into game cartridges was a everyday event. Not that it was bad: It just was standard. No matter if you had the games in plastic sleeves or not you always found yourself blowing dust out of the cartridge and at times wiggling it in the NES to make it work. The crazy part? Those games still work today, while many CD/DVD based games we bought just 3 years ago may be too scratched to be readable. Amazing, no? So why not take a trip down memory lane and turn cartridge blowing into music? Thats exactly what one person on ebay has done putting harmonicas into the entry part of the cartridge. Bids started at 7.00$ USD and have escalated as much as 50$ USD so far. Be sure to grab your Super Mario Bros. 3 or The Legend of Zelda custom harmonicas while supplies last. I am sure these won’t be the only going on sale, so be sure to keep checking out this ebay users account for future products.